Dr. Giblin joined the Mechanical Engineering Department in 2013. 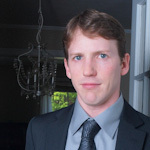 As a lifetime resident of Connecticut, he completed his BS and PhD at UConn in 2002 and 2007, respectively. His research centers on manipulation theory and control of mechanical systems. He teaches undergraduate courses in kinematics, dynamics, and programming. Dr. Giblin also teaches courses in a number of other engineering disciplines at the Avery Point campus, where he advises undergraduate students in engineering.